Throughout this module I feel like I have learnt how important the contextual information is in relation to graphic design and world issues, which help contextualise work and theoretical essays, which are given. The lectures have enabled me to research further into topics of interest such as fashion photography and post modernism and reflect this knowledge through my work. Whilst writing academic essays learning the Harvard referencing system has been invaluable to my present, and future work. Through further research and tutorials I feel like I have applied the above skills to my work, to the best of my ability. The discussions through the sessions, causing debate I feel is one of the best skills developed as it allows you to think, articulate and be passionate about your opinion on the topic at hand. I have carried out both primary and secondary research for both the academic essay and the brief history of brief. Visiting the libraries magazine archives was an invaluable primary research method, which was more than beneficial for the publication produced. I also sourced and read books, articles, online blogs and websites, as well as visiting private bookshops, and purchasing zines for research purposes. Looking through design and fashion blogs focusing on the 1980s gave inspiration for the aesthetics of the magazine. The above methods influenced the aesthetics and content of the publication, and the books, articles and journals read gave inspiration and quotes for the academic essay. Looking at publications and the chronology of the 1980s allowed me to order my publication effectively also. Class tutorials and crits also helped me make invaluable decisions regarding format, binding and ordering the content which helped structure and make the best possible publication. I have realised I am good at designing for editorial work, and that my design style is adaptable compared to briefs completed in other modules. I have identified strength for organising my workload, and the publication brief in general. The amount of research and imagery collected for the publication needed to be ordered and structured in order to effectively design the magazine, which was challenging at time due to the wealth of information collected. I am good at working to deadlines, and the skills mentioned will be invaluable throughout my time on the course. I have also found strengths of researching and archiving information. I feel as though my essay isn’t the best it could be, so this is something I would like to address in the future before the 2nd year commences through further researching and reading of published academic essays and journals. Overall I feel as though I have tried my best with every brief set and feel confident about what I have learnt and produced throughout the module. 1. Relate essay choice to publication to help specify research and be more contextualised and familiar with the background history. 2. Attend more sign-up crits to make sure my work is on track, and I am working in the right direction. 3. Visit more galleries and exhibitions in relation to topics being discussed in sessions/briefs to gain further insight and carry out primary research. 4. Even though I managed the workload for the publication, I felt at times I had taken on too much with the format and amount of content needed. 5. Be more vocal in class, to join in more with the class discussion to gain confidence in healthy debate and pubic speaking. The 21st century, in particular between 2000-10, has been shaped by the increase in mass-consumerism, mass advertising, a massive change in technology, political affairs and the UK government, in addition to changes overseas affecting how we live our daily lives. It has also affected the world of art. The negative changes that have shaped the past decade have caused a backlash of street artists to reflect, and demonstrated an opinion on the society, which they live in and are exposed too. It is important to look at the context of which the artwork is formed, as well as why. This newfound form of expressionist art has responded to issues the world are exposed too, which thanks to lightening speed digital communications, has been shared globally. Developing responses and opinions on issues has re-started a phenomenon; and street art is back with defiance. Firstly this essay will explain the changes in the 21st century proceeding to the changes in art in social media, by focusing on Banksy’s work, before concluding that street art has inevitably adapted itself to the institutionalized art industry, as well as how it has impacted society and culture today. It seeks to determine the links between society, power and culture through an art medium. It is imperative to understand how social networking, and increased digital technology has improved the way information is captured and shared globally. Vast advances have been made regarding the media, Internet, and communication shaping the world we live in today. Increased terrorist and illegal activities have also been taken to extreme levels in the past decade due to new technologies and political differences, with examples such as the 9/11 bombings and the phone hacking scandals. Due to these social and cultural issues, stemming from American Imperialism, security has improved, and everything we do is monitored, captured, analyzed and judged. However, on the contrary, we appear to be dictated by the government, democracy, and our freedom of speech is repressed to those who are willing to listen. Media conglomerates have enthralled the creative advertising world, making the environment we live in a mass-consumer driven canvas. As a nation, society attempts to direct us into living collectively with the same views, the same opinions, and the same outlook on life. Freedom of speech has become impossible, unless you think outside the box. The desire to stand up for your views against the cultural and social issues of society, fighting against the ‘system’ gives street artists a reason to paint and go against the norms and conventions of society, articulating their views and raising their voice in an institutionalized modern day culture. As Banksy once said; “A wall has always been the best place to publish your work [and] graffiti is only dangerous in the minds of three people; politicians, advertising executives and graffiti writers” (Wall and Piece, 2006, p.8). Art has never been dictated; it is self-expression, not oppression of thoughts and opinion. Banksy has “stood up anonymously in a western democracy and [called] for things no-one else believes in, like peace and justice and freedom” (Banksy, Wall and Piece, 2006, p.29), fighting through cleverly through out pieces of street art, often showing his cheeky attitude, puns, pranks and slight aggression towards the controlling world around us. Distance has never stopped Banksy making his mark, and has taken extreme lengths to make a statement. 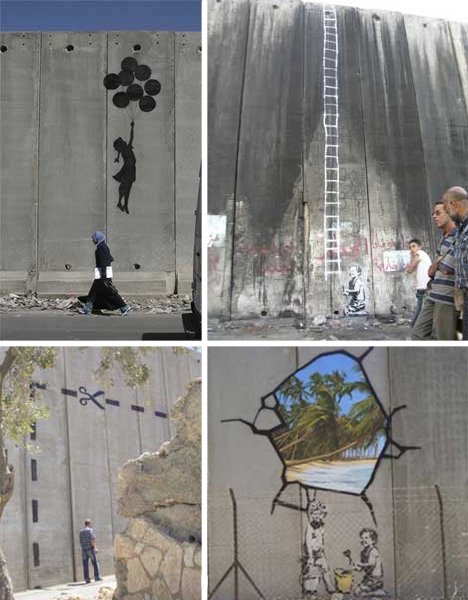 For example, he travelled to the Israeli Segregation Wall, painted 9 separate pieces of artwork on the ‘Palestine side’, causing controversy with locals, the security, and the world. (Image 1) Each painting is almost a ‘window’ looking through to the other side of wall. One particular painting shows a serene beach, which is undoubtedly the opposite of the reality. 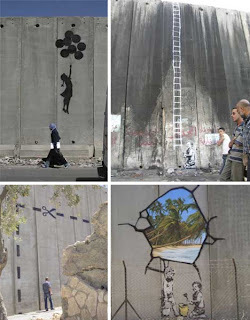 His statement and irony behind the concept was clever and eye catching, and the paintings told a thousand words - "The Israeli government is building a wall surrounding the occupied Palestinian territories. It stands three times the height of the Berlin Wall and will eventually run for over 700km - the distance from London to Zurich. The wall is illegal under international law and essentially turns Palestine into the world's largest open prison" (Sam Jones, 2005, The Guardian). Holding the Palestine’s citizens within the ‘prison’ gives the country power, which Noam Chomsky argues the US are backing; “While there has been internal debate and some fluctuation in US policy, much exaggerated in discussion here, it has been generally true that US support for Israel's militarization and expansion reflected the estimate of its power in the region.” (Chomsky, Good Reads). This says a lot about American Imperialism and it’s impact on societies views of the world around us, however the likes of Banksy who strive of rebellion are adamant to show their own opinion, the truth and passion in order to make a statement. Artists use their artwork as a way of exploiting the system, fighting back whilst making the public aware of such issues and mocking those who hold institutionalized power over civilians. Street Artists are the voice of the nation, being the voice of those who dare not speak for themselves. Fairey came to the height of this career in 2008, with the release of his Obama ‘HOPE’ poster for the presidential election; just after Obama won. He has a very defined style of work, which can only be described as “Andy Warhol meets Socialist Realism” (The Norman Lear Centre, p.3, 2009). Similarly to Banksy, with unique ‘guerilla’ styles of art, Fairey’s craft is reflected through bold imagery, stencils and sticker campaigns, with hidden socialist issues reflecting current affairs. Combined, their works make comment on the anarchic rebellion that still remains, but overlooking that for the benefit of others and a more positive future, as well as touching on racism and not letting that effect perceptions. It is unusual to witness a rebellious street artist deferring from anti-political statements, to move the exact opposite without motive. However, a simple image with a bold statement leaves the viewer to choose what they take from the visual campaign. “The American public is generally pretty superficial, so an image like that just allows them to project whatever limited idea they have onto it.” (Shepard Fairey, Interview Magazine) This philosophy also stands true in regards to Banksy’s work. The established morals of falling into a socialist trap prove that we obey advertising and mass-consumerism, regardless of the topic. 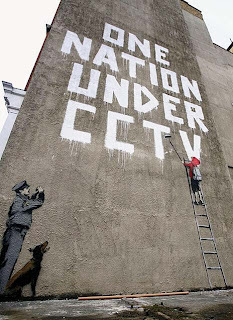 By allowing society to be open to a concept or idea which can be left open to personal interpretation and meaning, proves that Banksy is making a point about something we don’t even realize we are unconsciously doing, yet is right in front of us. This is propaganda. Every piece of his work produced is propaganda for a cause, just like the Palestine Prison. There is no better way to raise a point than advertising it in a way the entire world will see. Shepard Fairey’s work however, is heavily based on propaganda also, and focuses on the aesthetics of Russian publicity posters, which reigned throughout the revolution. Political issues shown through such simple mediums, leave the message being perceived open to interpretation. Banksy on the other hand focuses on stenciled art, controversial stunts, pranks and installation relative to location, concept and message. Banksy aims to shock and entertain the viewer, whilst causing stress to the target, i.e. government, public or police, whilst Fairey is much more politically correct throughout, however controversial the truth is. Banksy’s most controversial piece nevertheless, was a piece of installation placed in Disneyland California in September 2006, whilst being filmed by Thierry Guetta. His stunt consisted of placing a life size blow up doll, dressed in an orange jumpsuit, identical to those detained in Guantanamo Bay behind the gates of the ‘Big Thunder Mountain Railroad ride. The doll was placed at the side of the ride, visible to tourists and riders. Banksy’s spokeswoman made a statement regarding his lucrative intentions, and claimed “Banksy said the stunt was intended to highlight the plight of terror suspects at the controversial detention center in Cuba.” (BBC, 2006). His ideology behind the stunt worked; the park closed for 90 minutes until the installation was removed. The vast array of Banksy’s art shows he is passionate and committed to making a clear, bold statement, regardless of the consequences, proving he is “hardly a typical street graffiti artist working against the corporate establishment of advertising and its colonization of the street.” (The Lear Centre, p.4). His controversial and simple work has complex meanings of emotion, feeling, politics and progression of society, which are underlying the surface. His noticeable work turned viral during this decade due to mass-communication, media and those who have ‘obeyed’ and therefore advertised, or even turned to art themselves. The continued escalation of the campaigns have given street art a new found credibility; anarchic, rebellious and revolutionary art work, making ‘outdoor galleries’ much more interesting and real to view than galleries. “Street art began as an underground, anarchic, in-your-face appropriation of public visual surfaces, and has now become a major part of visual space.. a recognized art movement crossing over into the museum and gallery system” (Irvine, The Work On the Street, p.1) backing up the recent comeuppance of the art. During the early 21st century, artists were realizing that the street art phenomenon that has captured the entire world, through message, passion and even more crucially – Internet, the speed of data communication and social networking. Artists developed work more people were becoming interested in, such as installation and secret pop-up exhibitions not for the aesthetics, but for the meaning, concept, and message being delivered. Artists began changing their trade due to the ever-growing popularity and the desire for more. In June 2009, Banksy held his first exhibition in his hometown of Bristol, at the City Museum, which validated his level of recognition and fame. Over 100 pieces of artwork, including installations were displayed. Two pieces are still shown in the museum and kept in their permanent collection, which are on show to the public. As a prankster Banksy had previous placed pieces of his own work in the Tate and Louvre to observe the reception of the viewers. The collection shown in Bristol proved his popularity as an artist even though many view perceive him as working in a technically illegal vandalistic trade. Hence his response to his own top-secret exhibition; “This is the first show I've ever done where taxpayers' money is being used to hang my pictures up rather than scrape them off.” (BBC, 2006). He also stated after observing a piece of ‘pop-art’ he had placed in the Museum of Modern Art in New York, that he “took five minutes to watch what happened next. A sea of people walked up, stared and moved on looking confused and slightly cheated. I felt like a true modern artist” (Banksy, 2006, p.179). This very statement shows how museums and art galleries can transform a once looked-down upon skill, as a new fascination, which has suddenly become high culture, opposed to low culture regardless of it’s true rebellious meaning and contradiction of becoming a ‘sell out’. Due to the social and cultural changes regarding the influences of street art in the previous decade, “museum and gallery exhibitions and international media coverage have taken Shepard Fairey, Banksy, Swoon, and many others to levels of recognition unknown in the institutionally authorized art world” (Martin Irvine, Georgetown University, 2012) opposed to making them ‘sell outs’, which is known to be the general preconceived notion of these particular artists, due to their work being commercially used and replicated for mass-media and mass-consumerism with merchandise, books and ‘propaganda’. Having work in world-renowned galleries is proof enough that people are being to see a change in the art world, and not focus strictly on ‘fine arts’. The freedom of creativity has been praised and unleashed for critique from the academics, art critics and celebrities, who are willing to pay high prices for ‘an original Banksy’. For example, one of his more unknown works ‘Insane clown’ which is simply a stenciled image spray painting on hessian, sold at an auction house in 2009, for $320,000. In 2008, Banksy’s ‘Vandalized Phone box’ installation, sold for $550,000 at Sotheby’s in New York, whilst a defaced Damien Hurst ‘Spot Painting’ cleverly entitled ‘Keep it Spotless’ sold for $1,700,000. The argument between whether street art is deserving of gallery walls is a popular discussion for those in the art world. Terry Smith once said “In the context of art theory in the institutional art world, street art and artists seem made-to-order for a time when there is no acknowledged “period” identity for contemporary art” (Irvine 2011) demonstrating how street-art has come alive at the appropriate time. Street art has earned itself its own name and recognition; however, it hasn’t become categorized yet, like photography has for example. This is backed up by Irvine when he states that “it hasn’t been adopted as a category for advancing art-institutional replication, the prime objective of the art professions.. The street art movement embodies many of the anti-institutional arguments elaborated in the art world of the past fifty years” (Irvine, 2011) showing the mixed reception, however is still seen darted around galleries, and through private gallery exhibitions. By street art now being institutionally acceptable, artists have started to bring their work from the walls outside, to walls on the inside. They have had to adapt to the ideology that street art no longer only appears on the streets outside the galleries, but on the walls within it Over a decade ago, street art would not be seen anywhere other than backstreet allies or known skate areas, whilst in modern day and age, it has been the most successful, unorthodox, yet honest medium of art there is, and it’s appreciated for that reason. Artists have had to deal with the changes in society, culture and the change in public opinion, and had to adapt to these needs of their audience whilst staying true to their beliefs, ethics and views as an artist. It is without a doubt that the Internet and increased interest of commercialized art and merchandise, combined with social networking, having given street art the credibility it has needed and deserved for so long to receive such recognition from fine art institutions. If it is in one of the best galleries in the world such as The Museum of Modern Art in New York; something is going right. Both artists will stay true to their unique styles and work, regardless of crossing over into the institutionalized world of fine art. Street Art is becoming more recognizable as a form of quality art, opposed to being labeled ‘vandalism’ or ‘graffiti’. The truth, reality and prosperity shown through art, have made a point publicly of raising awareness of issues normally dictated by leadership and commercialism, and in the past decade has proven globally that street art is not a phase, it’s a way of communicating a message to those looking for an alternative to the system; those searching for an alternate train of thought and furthermore truth, reality and rebellion. It’s here to stay; with a voice, an attitude and a passion. Irvine, M. (2011) ‘The Handbook of Visual Culture’, ‘The work on the street: street art and visual culture’ 1st ed, Burg Publishers, p. 1. Irvine, M. (2011) ‘The Handbook of Visual Culture’, ‘The work on the street: street art and visual culture’ 1st ed, Burg Publishers, p. 3.